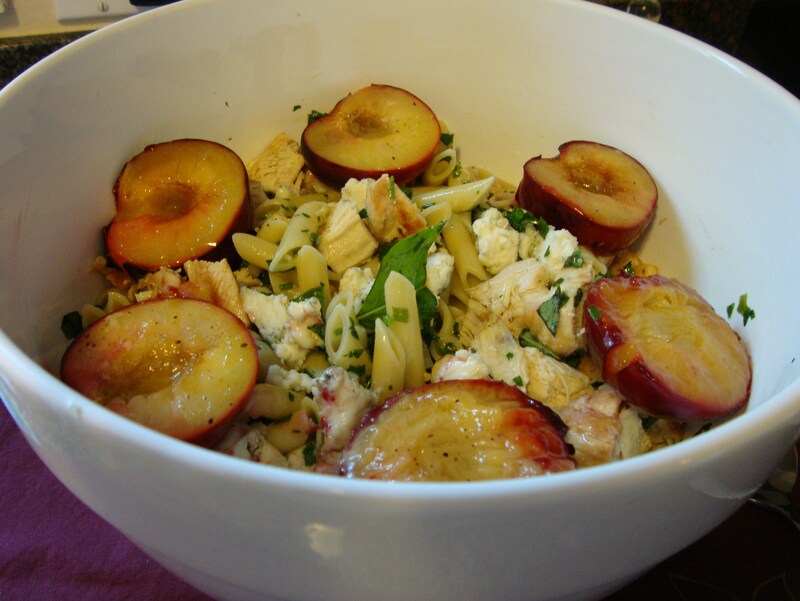 I continued on my Tyler Florence kick this week with an amazing pasta salad: Cold Pasta Salad with Roasted Chicken, Plums, Blue Cheese and Basil. This is one of the most deeee-licious pasta salads I’ve ever consumed. I think it’s the combo of sweet fruit, savory herbs and chicken and the sharpness of the cheese. It’s awesome cold or hot — and the leftovers are easy to pack up for a bag lunch during the week. 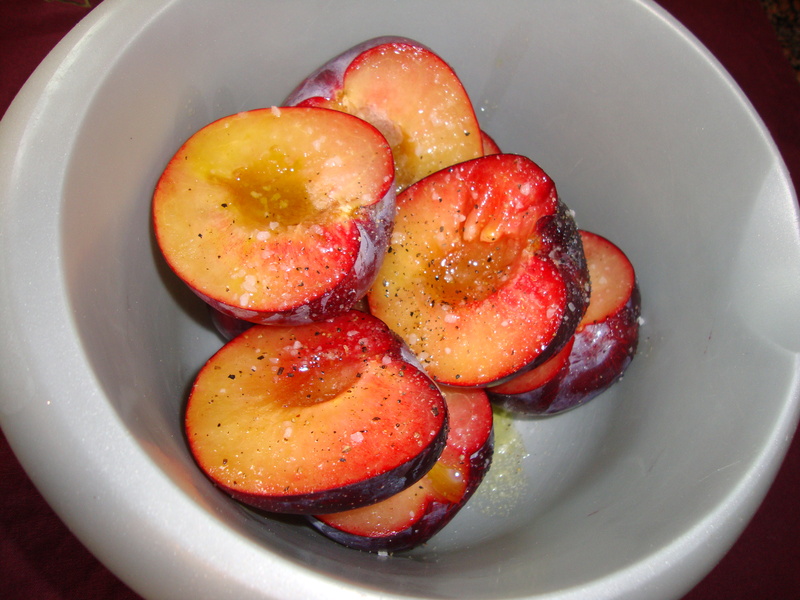 I used farmers market plums, which you drizzle with olive oil and hit with kosher salt and pepper. Then, they’re added to the oven with the chicken to roast the last 8 minutes. The dressing (below) is super flavorful and delicious. Tyler says this serves 4. More like 8. Or more. This is yummy hot or cold. I tend to heat it up. Use fresh herbs. Otherwise, it’s not even worth it. When I roasted the plums, I let them sit on the pan for a while after I took them out of the oven while I cut the chicken. Don’t do that — the ones that were cut-side down got mushy. Still good, but mushy. I cut the chicken into bite-size pieces, as well as the plums, so you don’t have to be cutting while you eat. One pound of plums equals about 4-5. Preheat the oven to 375˚F. Bring a big pot of salted water to a boil over high heat for the pasta. Heat a 2-count of oil in a cast-iron or some other ovenproof skillet over medium heat until almost smoking. Sprinkle the chicken breasts with a generous amount of salt and pepper and cook for 5 minutes, then flip the breasts and cook for 5 more minutes. Flip the breasts again, toss the pan in the oven and roast for about 25 minutes, or until the juices run clear when you stick a small knife into the chicken. Meanwhile toss the plums in a bowl with a drizzle of the olive oil, salt, and pepper. Throw them in with the chicken during the last 8 minutes of cooking. 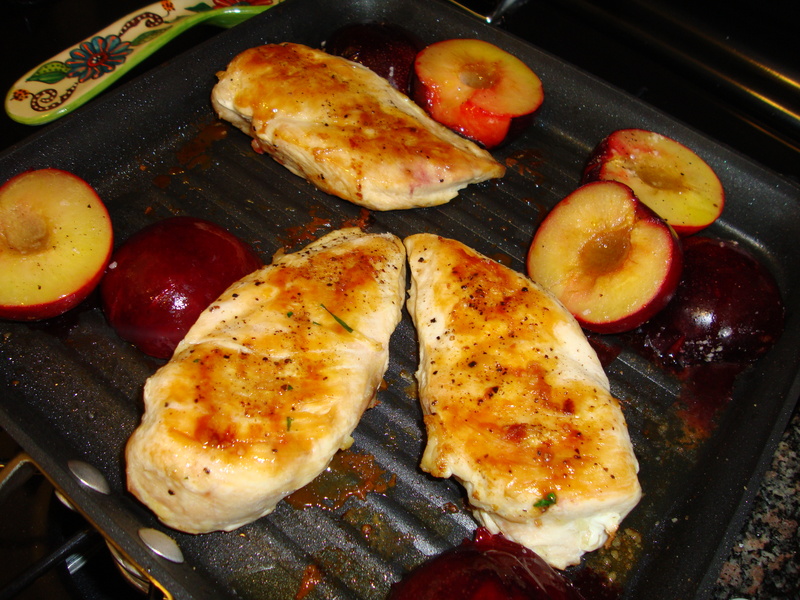 Take the chicken and plums out of the pan, cool slightly, then stick them both in the refrigerator to chill. Meanwhile, when the pasta water comes to a boil, add the penne and give it a stir to keep the penne from sticking together. Boil 8 to 9 minutes until al dente. Drain in a colander and chill under cold, running water. Drain again. The last thing is to make the vinaigrette: Whisk together the mustard, vinegar, and sugar in a large serving bowl. Whisk in the oil and season with salt and pepper. 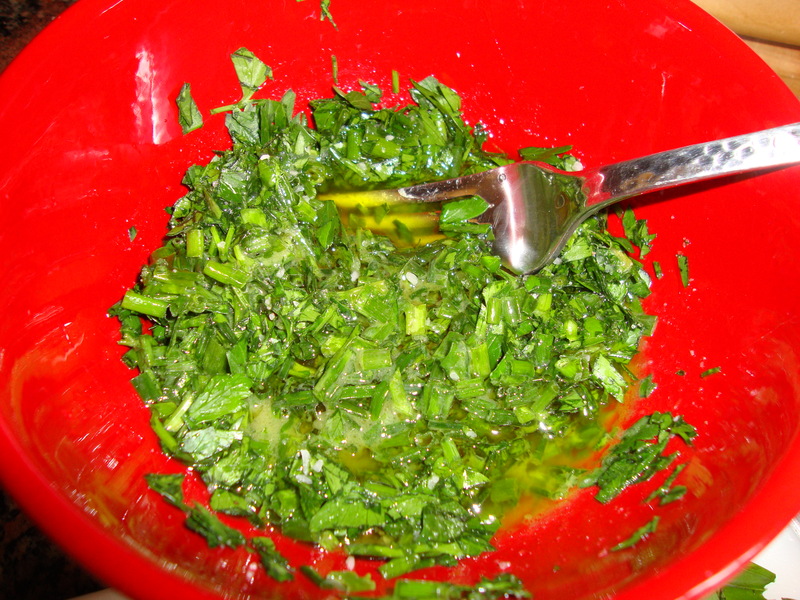 Fold in the herbs. Slice the chilled chicken and toss into the bowl along with the pasta, the blue cheese, and the basil leaves. Toss, and taste for seasoning. Mound on a plate with the plums alongside. 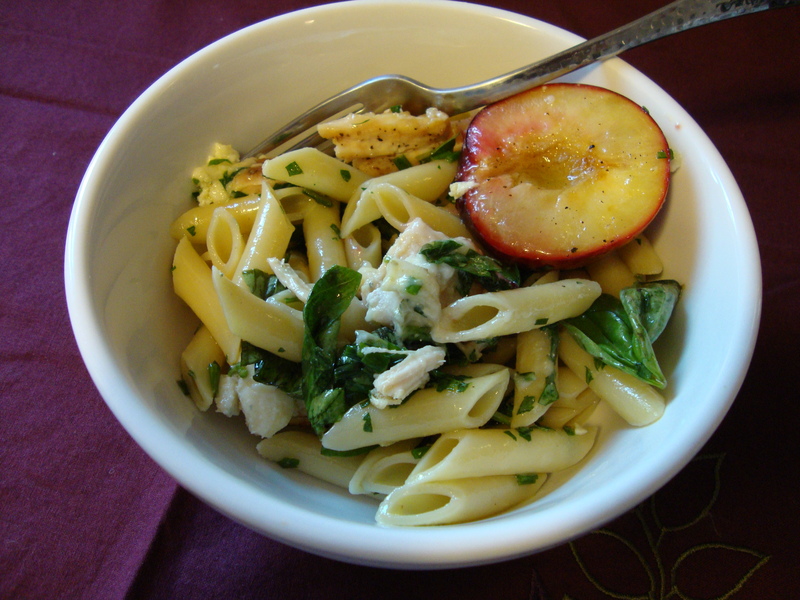 This entry was posted in Recipes, Uncategorized and tagged blue cheese, chicken, plums by Tricia. Bookmark the permalink. That’s a beautiful presentation and seems pretty easy to make! I’m going to keep this in mind for the next time I need a potluck dish. Thanks, and it is easy! It would be great for a potluck.